SIS LIVE: OB and satellite uplink trucks in London. Milton Keynes, 18th April 2013: National and international broadcasters relied on SIS LIVE to provide live coverage of the funeral procession of former Prime Minister Margaret Thatcher. Baroness Thatcher was given a ceremonial funeral, with 700 military personnel from all three forces lining the route. SIS LIVE provided much of the comprehensive broadcasting infrastructure to capture the event. SIS LIVE’s OB and satellite uplink trucks were stationed at key points in central London and along the route from Westminster to St Paul’s. SIS LIVE provided production facilities via OB 7, its state-of-the-art OB truck, located 50 miles away at its Milton Keynes headquarters. The offices in Milton Keynes are home to one of SIS LIVE’s satellite teleports and 24 hour MCR, where 14 HD feeds were brought in either via satellite or fibre for production in OB 7. The programme output from OB 7 was then transmitted to two different satellites and distributed to BT Tower to be watched by audiences across the globe. The ability to utilise SIS LIVE’s extensive teleport and fibre infrastructure was key, as it allowed all international production facilities to be based away from London, where space was at a premium and security a major concern. 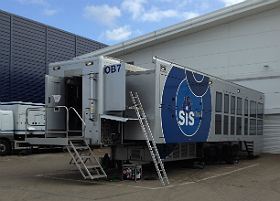 The success of this approach has led SIS LIVE to put in a permanent fibre infrastructure within their Milton Keynes site, to allow one of their large OB trucks to park up with connectivity to their teleport and national fibre infrastructure, at any time and at short notice. This capability will allow for major productions to be covered remotely and offers a unique opportunity for broadcasters to offer extensive coverage without the need to be at the event. SIS LIVE also provided all of the comms and satellite link facilities for the production connecting five different sites around London and transmitting to broadcasters worldwide.